Himachal Pradesh Congress has refuted the allegations of Bharatiya Janata Party that the government is indulging in political vendetta and blamed previous Prem Kumar Dhumal regime for invading their political opponents’ privacy. 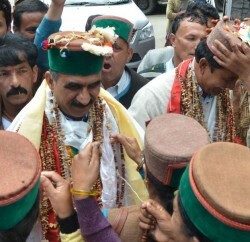 In his press communiqué, Himachal Pradesh Congress Committee Chief Thakur Sukhvinder Singh (Sukhu) alleged that the previous regime had adopted a vindictive approach to counter their political opponents. Congress chief said that the BJP government had renamed a number of centrally sponsored schemes after former Prime Minister Atal Bihari Vajpayee to present those as its own achievements. He claimed that the Govt has taken remedial measures to set the record straight. He alleged that the previous government had tried to sell Vajpayee’s name to get political mileage. 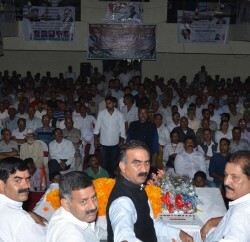 Sukhu claimed that the state fallen behind in development under the BJP. He also blamed previous regime for blatant misuse of the state machinery to eavesdrop on individuals. Congress president asserted that the BJP had adopted a policy of accusing the UPA government of discriminating against the state even though it benefited the most from Central funds. He said that the tactics of the BJP had proved counter-productive and it was thrown out of power by the people. Sukhvinder Singh accused BJP for levelling baseless charges and claimed that it’s doing it only to keep itself politically afloat.